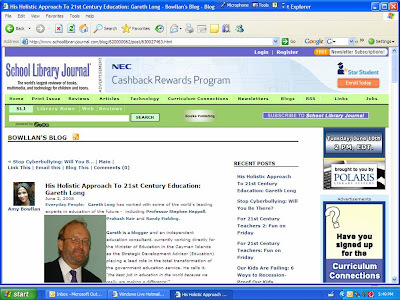 Gareth Long - Education: Good Heavens - a blog post about me and 21st century education! Good Heavens - a blog post about me and 21st century education! I was very surprised and humbled (but delighted) to be asked by Amy Bowllan to be the first subject of a new series on her New York based blog about people being involved with 21st century education around the world. The fact that she is interested in the work that I have been doing with the Ministry in the Cayman Islands and the whole Cayman education transformation story is very pleasing, and further evidence of the growing international interest. Amy is a well respected blogger with a large following, begining her career as a Television Investigative Producer and Reporter for WCBS-TV NY and KNXV in Phoenix, AZ. She also snagged two Emmy awards for Broadcast Journalism and several Associated Press awards. She now is the Director of Communications and Educational Technology at The Hewitt School in NYC and is responsible for integrating technological resources into staff and students day to day programs. All I can say is "Thanks Amy!" To see Amy's post about Gareth: click here. ...and thank you, Gareth! The pleasure was mine. Do keep in touch with all of your wonderful work.